GaryMoller.com - Health, Fitness - Naturally! : Does Glucosamine really work? I saw your video on youtube about the different types of glucosamine substances for knee joints. I am 18 and trying to join the military, I have already had surgery on my knee to smooth out rough cartilage, my doctor says that genetically my cartilage is soft and thin, he says they look like the knees of a 40 yr old man (and im only 18 yrs old). Image: Lorraine Moller - Strong legs from progressive conditioning during her early years. I've been taking some Glucosamine Sulfate for awhile, it seems to help a little, what i was wondering is what type of glucosamine you would suggest for me, on you video you show the glucosamine for athletes, but since my cartilage is not the same as other young atheletes do you feel I should be taking the glucosamine for older joints? the one with higher MSM in it? I've tried to do a lot of research on the internet about weather or not Glucosamine actually works, I have found some reports that say it only has a placebo affect, and some reports show that it does regrow cartilage, what do you think? I assume that the surgery was for chondomalacia patella, which is a condition caused by excess wear of the underside of the kneecap. Even if there was roughening, shaving the surface is not the best option. It obviously has been of limited success given that you are seeking further assistance for knee care. Please start your quest for healthy knees by reading the dozen or so articles here. The comment that your knees are genetically soft and thin etc is a ridiculous statement to make and unhelpful. You are young. Your tissues are too thin and soft. This has nothing to do with genetics. It is an increasing problem worldwide as children are raised more like caged hens than anything else and fattened with GM corn. The state of your cartilage is the result of your nutrition and the way you use your body. 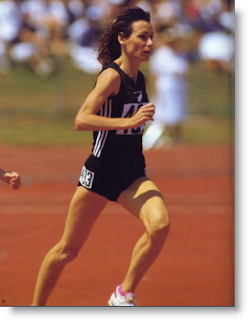 I have reproduced the photo above of Lorraine to show you a superbly conditioned and nourished athlete who ran huge distances from early teens to her mid 40's. Her early conditioning was tied to her young and growing body and progressive. She never had a significant knee problem. Many young athletes and their coaches throw the kids into hazardous competition situations without regards to the need to first prepare the body with progressive conditioning. First rule of coaching: Do not injure! A good coach will set their goal to get their athletes through to maturity (20+ years) without having suffered career limiting injuries or illness. Nutrition is a badly neglected area and what advice there is tends to have been hijacked by the big food companies who dominate advertising in sports media and sports events. They drive academic training and research by commercial partnerships with academia. So, we end up with athletes being raised on corn syrup and colourings! With regards to your weak cartilages, you need to look closely at what you are eating and ensure that your diet is nutrient dense by ensuring that most of what you eat is from fresh natural sources and home cooked (there is plenty of advice on this website about this). If you are living on Powerade, low fat milk, instant noodles and chicken for example, then how can you have strong bones? If you are not sporting a light year-round tan then the only outcome is bones, cartilages and muscles simular to those of a caged battery hen - soft! Emulate the lifestyle of a free range hen - sun, daily exercise and a wide variety of healthy grubs! In your case, the best one is Balance Joint and Cartilage Repair for Athletes. This is formulated for young joints that are being subjected to damage. It contains higher ratios of MSM and glucosamine and less chondroitin as compared to other formulations. The MSM and glucosamine are the principal nutrients for cartilage repair. Chondroitin helps hydrate the cartilages. A young joint does not need much of this nutrient, so there is not as much in this athlete formulation. On the days you do not get sun I recommend that you take 4,000iu of natural vitamin D. If you are low in vitamin D (most people are very low nowdays) you will be prone to tendon, cartilage and bone problems. Yes it does. I have been prescribing these nutrition supplements for about 15 years and I have seen countless cases of benefit - benefit more often than not. Experts who say it does not work need to be challenged. For a start; does a surgeon or even a general doctor know much about nutrition? Not if they happened to fall asleep during the one hour of training they had on the subject and that might have been 20 years ago. When you read any research discrediting these products there are many questions to be asked, such as how advanced the arthritis was among the subjects, how much were they given and for how long, what about combinations of supplements, what measures were used and so on and so on. Be consistent in taking the right glucosamine supplement for you for at least three months and to support this with a healthy diet and sensible exercise that does not do further damage to the joints. Is the military the right career for you? Basic military training, consisting of forced hikes with heavy gear on your back, leaping out of trucks and running obstacle courses and lots of squatting down, is hard on the knees. Having done my own stint in the NZ Army as a foot soldier and having a daughter who has recently completed a year in the army, I am familiar with the stresses and strains on the legs of the kind of basic military training which you will have to undergo without complaint. My gut feeling is that it is better to avoid this kind of situation in which you are compelled to push the limits of your knees without respite. You may end up being one of the recruits who get medically pushed out. It may be better for you over the longterm to give your knees a couple of years of careful nurturing through progressive strenghtening and nutrition. You can review the military career once you are super fit and pain free. If the military force you are considering joining has a history of torture, indiscriminate killings of civilians, assasinations, propping up of dictators and despots and planting itself in oil rich countries where it is not welcome, please reconsider your choice of career for our sake.